Sputnik Planitia (the left lobe of Pluto's "heart") likely formed in the aftermath of a comet impact into Pluto. Sputnik Planitia formed northwest of its present location, and reoriented to its present location as the basin filled with volatile ices. Pluto's famous heart-shaped feature caused the dwarf planet to roll over the eons, and this reorientation probably wouldn't have been possible without a subsurface ocean, new research suggests. The left lobe of Pluto's "heart" is a 600-mile-wide (1,000 kilometers) plain called Sputnik Planitia (formerly known as Sputnik Planum), which astronomers think is an enormous impact crater. This basin has been filling with nitrogen ice over the years and now contains huge amounts of the stuff. Indeed, observations by NASA's New Horizons spacecraft, which flew by Pluto last year, suggest that Sputnik Planitia's ice may be up to 6 miles (10 km) thick. In the first study, James Keane, a doctoral student at the University of Arizona's Lunar and Planetary Laboratory, and his colleagues modeled what happened as nitrogen ice accumulated in Sputnik Planitia. The results were dramatic. "Once enough ice has piled up, maybe a hundred meters thick, it starts to overwhelm the planet's shape, which dictates the planet's orientation," Keane said in a statement. "And if you have an excess of mass in one spot on the planet, it wants to go to the equator. Eventually, over millions of years, it will drag the whole planet over." This animation shows how Pluto reoriented in response to volatile ices filling Sputnik Planitia (the left lobe of Pluto's heart). Sputnik Planitia started northwest of its present position, and as it filled with ices, the tides from Charon (Pluto's largest moon) caused the entire dwarf planet to reorient. Pluto's reorientation would have stressed the dwarf planet's crust, leading to a network of faults and fractures on the surface, Keane and his colleagues report. And New Horizons spotted just such a network, whose characteristics match those predicted by the team's models, they said. 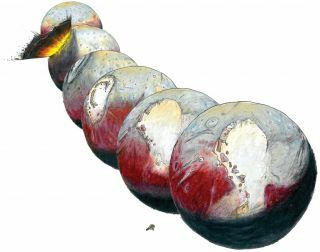 Those models assume that Pluto harbors a subsurface ocean of liquid water — a notion bolstered by the second study, which was led by Francis Nimmo, a professor of Earth and planetary sciences at the University of California, Santa Cruz. Nimmo and his team determined that the odds of Sputnik Planitia occurring in its present location, so close to the tidal axis, purely by chance were just 5 percent. So they, too, believe that a substantial reorientation has taken place. The researchers suggested that the impact that created the basin weakened the crust overlying a buried ocean, causing some of the water to rise close to the surface. This action, along with the deposition of nitrogen ice in Sputnik Planitia, would have created enough of a "positive mass anomaly" to roll the dwarf planet, Nimmo and his colleagues wrote. It's hard to imagine Pluto reorienting in this way if it didn't have an ocean, Nimmo said. For example, the team's calculations suggest that Sputnik Planitia's ice layer would have to be 25 miles (40 km) thick if no ocean existed. The team also considered the possibility that rock migrated in to make up the extra mass, but that explanation doesn't seem likely, either, Nimmo said. "The rock is so far down there, and it's also pretty strong," he said. "So it's hard to figure out how that rock would get moved around in the way that you would need." Other research groups also have suggested that Pluto may harbor a subsurface ocean, using other lines of evidence. One such argument points to the dwarf planet's surface fractures, which may be the result of this ocean gradually freezing over time — a prospect also raised by Keane and his colleagues in their paper. (Water expands as it freezes, which would lead to stresses in overlying rock or ice.) In addition, Nimmo said, Pluto doesn't have an equatorial bulge — and bodies with oceans can't maintain such a bulge. "All these lines of argument are pointing in the same direction," Nimmo said. This cutaway image of Pluto shows a section through the area of Sputnik Planitia, with dark blue representing a subsurface ocean and light blue for the frozen crust. If Pluto does have an ocean, how has it managed to avoid freezing up entirely over the past 4.5 billion years? Pluto is big enough that it may have retained a substantial amount of internal heat, Nimmo said. And the dwarf planet's water may contain significant amounts of ammonia or other substances that act as an antifreeze, he added. Astronomers think subsurface oceans exist on the Saturn moons Enceladus and Titan; the Jovian satellites Europa, Ganymede and Callisto; and a number of other solar system bodies. Indeed, such buried water may be abundant in the Kuiper Belt, the ring of frigid objects beyond Neptune's orbit, Nimmo said. "My guess is that, on big Kuiper Belt objects, these kinds of oceans are pretty common," Nimmo said. "One of the lessons of the last 20 years is that oceans pop up in all kinds of unexpected places."